Price listed is for 6 ft. wide model shown; other models are available, see the drop down menu to order another model, other models may add or subtract to the price listed above. 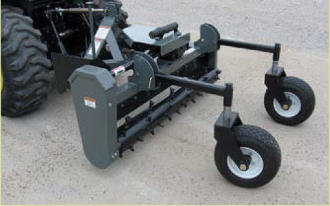 Model PTHD-640 is a powered landscape rake for medium sized tractors from 35-75 hp. rugged 4" x 4" x 1/4" frame, dual flip-up gauge wheel on 5-bolt hubs and heavy-duty adjustable material bar to control processed material flow.